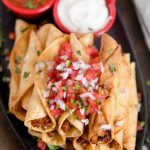 Everyone loves these creamy, cheesy Chicken Taquitos! Corn tortillas are filled with chicken, cream cheese, salsa and colby-jack cheese, then rolled and fried to crispy perfection! In a large bowl, combine all ingredients except tortillas and oil. Wrap tortillas in a kitchen towel and heat in the microwave for 1 minute, or until they are soft enough to roll easily. Keep them wrapped as you work. Place about 2 tablespoons of the chicken mixture on one side of a tortilla and roll it tightly into a log shape, as tightly as possible but careful not to break the tortilla. Secure with 1 or 2 toothpicks. If a tortilla breaks as you are rolling it, get a fresh one. Continue this method until you've either made your desired amount of taquitos or your meat is gone. (If you have leftover meat it keeps quite well in the freezer). Pour about an inch of oil into a large, deep pan and heat over medium-high heat. Once the oil is hot, fry the taquitos for about 5 minutes per side or until they are starting to look browned and feel crispy. Remember that they will continue to crisp as they sit. Place them on a paper towel lined surface to drain. Serve hot with salsa, sour cream or guacamole. These can also be baked in a 400 degree oven for about 12-15 minutes. To reheat leftover tacos, place them in a hot skillet with a little bit of corn oil and turn often. To reheat leftovers, heat a small amount of oil in a skillet and fry for a couple of minutes per side, or bake in a 350 degree oven until heated through; 5-7 minutes.